For the release of an annual Christmas Calendar for Denmark's Radio I worked with THANK YOU to create a fun christmas narrative with traditional Danish folk characters. Together, Bamse & Kylling (Translation: teddybear & chicken) carry a calendar in the mail as they travel from winter wonderland to a joyfull "Christmas Island". The only catch to our production is that all of the characters in this piece were part of a rigid hand-made diorama. I was able to photograph the characters and scenery as reference but the majority would require identical recreations before we could animate. After arranging the winter wonderland and Christmas island environments into a narrative, Pawel Nowakowski and I created a styrofoam planet to transport our characters. We then hand painted all of the backgrounds on false walls and then created artificial terrain features and characters out of everything from pipe-cleaners, to styrofoam, to sculpting clay. Everything was to be shot in stop motion so I created a custom environment and lighting style in the studio. Over the course of two weeks Pawel and I would animate, test, rebuild and paint all each of the scenes. 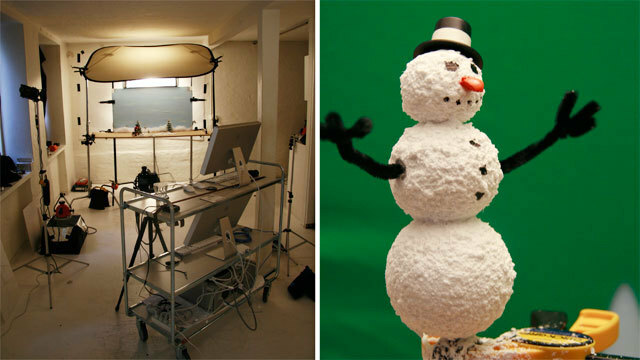 We wanted the freedom to composite layers of animation in post-production so various objects—such as the snowman pictured here—were shot on green screen to be added later. All of the principle animation was completed using Dragonframe stop motion software and later edited into a hybrid digital video. The final video was released before the holiday season and all proceeds were donated to Danish charities.